While we recently told you the technical launch of the first Nordhavn 120, Nordhavn Pacific Asian Enterprises also recently delivered its latest Nordhavn 86 explorer yacht. Delivered in April, the 9th hull of this successful series was delivered on the West US coast. Called Rest Assured, she's a customised version of the 86'. 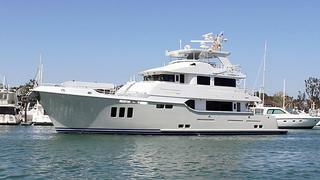 As a reminder, the Nordhavn 86 is an explorer yacht series of 26.39m. She became the flagship of the yard when her first hull was delivered in 2008. Built in composite, she's powered by twin economical 600hp MTU engines in standard. The interior accommodates 8 guests in four cabins and crew quarters for 4.